S.Belsky asks: Where did the phrase “take a gander” come from? What the hell is a “gander” and why would I want to take it? As you are no doubt aware, but for those who aren’t familiar with the phrase, “take a gander” is an expression meaning “take a look”, “get a peek”, “check it out”, etc. It first popped up around the late 19th / early 20th century. It is based on the “male goose” definition of “gander”. “Gander”, meaning “male goose”, derives from the Old English “gandra”, which ultimately comes from the Proto-Indo-European root *ghans-, meaning “goose”. So how did “take a gander”, essentially meaning “take a male goose”, come to mean “take a look”? It is thought by some etymologists to have originated from “thieves’ slang”, much like “tip” as in “leave a tip”, but this time originating in the United States, rather than Brittan. Whether thieves came up with it or not, this usage is referencing the fact that geese have long necks and like to poke their heads just about everywhere (literally, watch out if you’re around a gaggle of people friendly geese, particularly if you’re wearing a dress or just if you’re a guy and want to keep your sensitive bits unpoked). 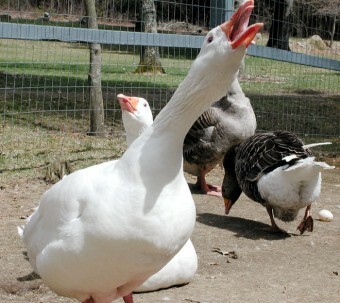 So, basically, geese appear to be a bunch of rubberneckers. Thus, to “take a gander” meant to “stretch your neck and see”, as a long-necked goose would. In the beginning of this sort of “look” definition of “gander”, the word was often used as a verb, rather than in the phrase “take a gander” where it is used in its noun form. But starting around 1914, this switched and over the next several decades the noun form became more common and today hearing someone use the verb form is fairly rare. Around the 17th century, “gander” also was used as a verb to mean “to wander foolishly/aimlessly”. Geese mate for life unless something happens to their chosen partner. If so, they’ll eventually find another to take their place. During nesting season, if you see just one goose hanging out, it’s probably a gander and if you tried to get close to where it’s at, it will probably attack you as it guards the nest. Also during the nesting season, the adult geese lose the ability to fly as they molt and drop their wing feathers. This coincides with the baby geese, called goslings, maturing to the point where they can fly (which takes 2-3 months). This is also why geese so frequently choose to put their nests near a body of water; so they can still get away from many predators during the time period they can’t fly. Around 6 weeks after molting, the adults can once again soar the sky. That’s very interesting thanks for imparting the knowledge. I’d heard it a long time ago probably around one of my grandmothers and got a very vague sense of what it meant, but never dwelled further on it. Then one hilarious day my crackpot husband tries to use this figure of speech, along with something about a goose, to insinuate i’m a gold digger. I concluded and was extremely offended. Guess it makes him feel smart to use old terms no one cares about anymore. Wonder if divorce papers feel very smart as well? I’m the type of person to become severely depressed not being able to care for myself I don’t even like asking for help so i’m most certainly not a gold digger. I’m afraid this article misses the point completely. Not doubting your research and I’m sure there is some truth to what you are saying. But the term actually comes from Cockney Rhyming Slang. Apple and Pairs – Stairs; Dog and Bone – Phone; Nanny Goat – Coat………. Ganders Beak – Peek. Also acceptable is Butchers Hook – Look. Now I feel I should add to this here (because every American film/tv show has got this wrong), In CRS you only say the first word. You do not go up the apple and pairs to answer the dog and bone, and get your nanny goat. You go up the apple, get the dog and grab your nanny. The amount of Cockney’s in american shows that are forced by script writers to say “Get your mince pies on that”…… Or “There’s gonna be Barney Rubble”…. It’s Cockney rhyming slang. “Goose and Duck” became “Gander and Duck” = look. See also the nursery rhyme “Goosey Goosey Gander” which is where the ” wander” association comes from. “Goose” still has a sexual meaning in British culture, and that the nursery rhyme preserves these sexual overtones (“In my lady’s chamber”) which is why “goose” was dropped and “Gander” became the shortened version. If you regard my entry on the subject, you’ll perceive that the meaning of “goosey goosey gander” resolves to: gose & goose lookalike; an equivalent of “like an egg to an egg” < context: resemblance. Which means: "are alike". And you will most certainly use the phrase in cases when a certain person acts exactly as another already famed for acting in that particular way. No sun, it comes from ancient Albanian. The ones that came with Hadrian to Anglia and marked the upper left angle / corner of Roman Civilization with a wall. 1. Ga:~, Gan~, is the root-word which means a comparative looking. The look alike. As in “The soon is a perfect gander of his father”. “Take a gander” will therefore mean: to take a look at something in comparative or in alignment with the looks of something (you haven’t seen before) with something you know. A glance which will instantly reveal (obvious) similarities. Similarities between a known subject, a paradigm, model, specimen, pattern, prill and a newly appearing or recently encountered subject. 2. Angle; angular. 3. Steep; aslope; slantwise . Empirically: a glance at which you don’t even have to look straight at the subject. Gaemt – strabismus; to have crossed eyes. Among my ancestors, one of the originals is the family called Gander. Whence that comes I do not know, but what I have been told is that during the persecution of the consistent Roman Catholics in England by the new zealous Protestants there was an office designated ” The Witch-Finder General”, one of whom was presumably surnamed Gander, nick-named Goosey from the manner of his strutting search around the houses of those whose absence from Sunday Church services was reported by village squires. His was not just a quick glance but an in-depth analysis of the measurements and spaces in a building to find whether all the volume of the building could have accommodated space for a priest’s refuge cell. My interest was aroused by the possibility of his having been near the family line of one of my Great-grandmothers.